As I am wrapping up a few projects I wanted to quiz people about the card sets for existing minis. I am working on the Cosmic Retro Space sets at the moment and I have a question. 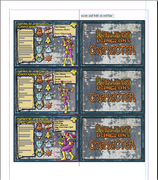 When I'm working on the cards, I am using the Cosmic Space Patrol as the default character types. The Imperiax and Invaders are Opponent cards. Would you like more generic cards for Characters and Opponents (as I did with the Eldritch Horror sets) or specific characters (like in Frosty Encounters)? Cosmic cards are coming together. I will have some rules for Hulk Skulks as well (Sci fi Dungeon Crawls).